Very convenient, found reservations. Ordered at the restaurant and coupon applied at cashier. Very good fugu. Had the sashimi, bbq and hot pot. Yuzu sherbet for dessert was very good. Ordered the sake with the roasted fugu, they light it at your table. So good. Try a popular local delicacy, the pufferfish, when you dine at Guenpin Fugu, Japan's number one pufferfish restaurant chain! 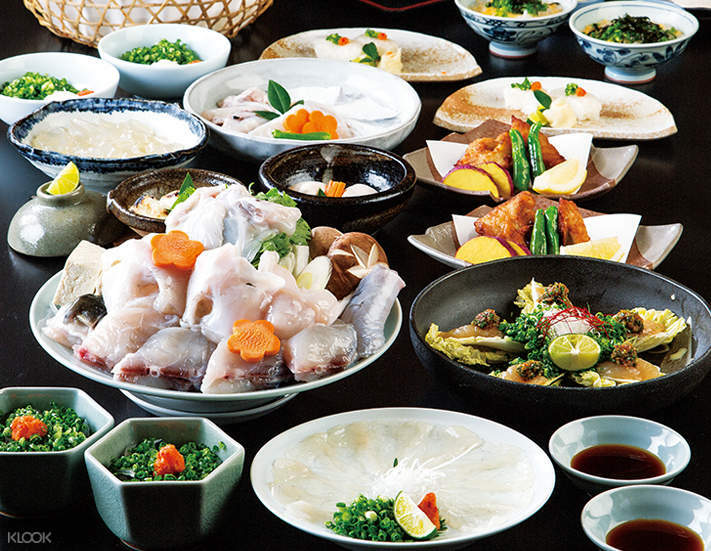 With over 96 outlets in the country, Guenpin Fugu is known for their tasty recipes using the tiger pufferfish, the highest-quality fugu in Japan, prepared with their original techniques that are internationally-patented. 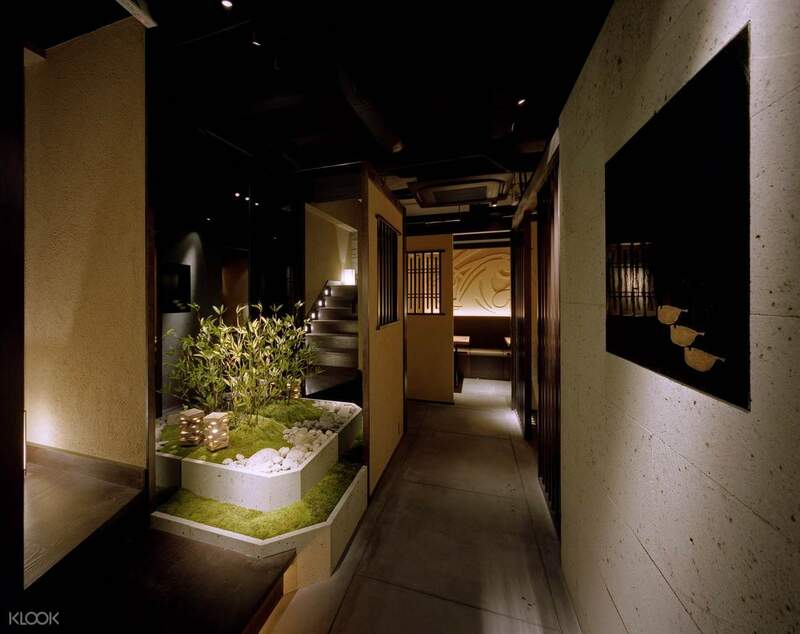 Sit back and relax in the restaurant's comfortable setting that uses wooden paneling, cozy lighting, and ceramic tableware that give off a traditional Japanese ambience. 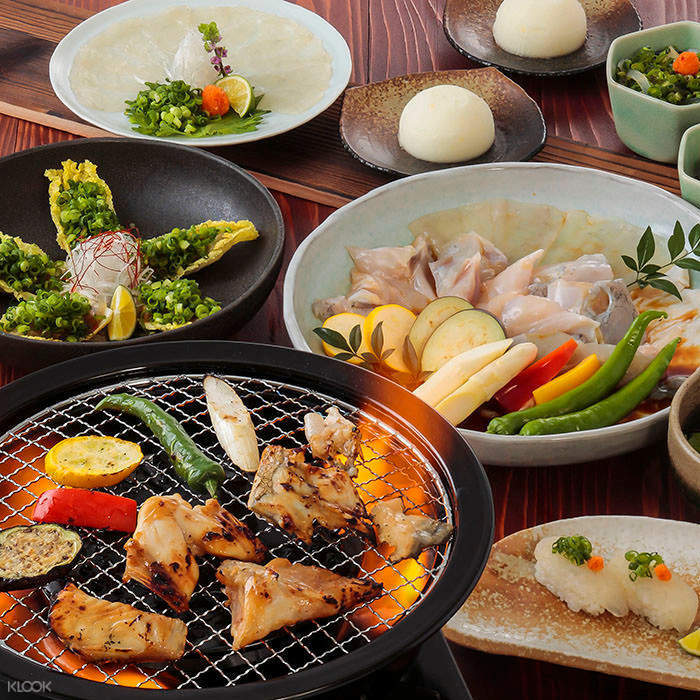 Choose from four different meal sets at great prices: Guen, Daigo, Tenraku and Guenyaguen, all of which are prepared by highly skilled chefs with years of experience preparing pufferfish - if prepared wrong, it might be your last meal! You'll also enjoy a hassle-free visit to Guenpin Fugu by booking through Klook's exclusive reservation service! 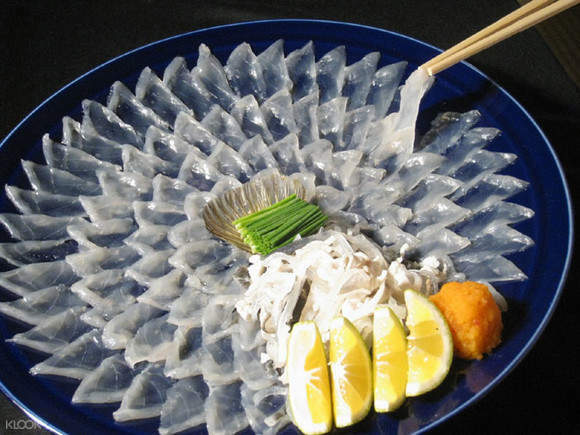 Taste a local delicacy and stop by Guenpin Fugu in Osaka, the #1 fugu chain in Japan! Book through Klook and enjoy our exclusive reservation service! First time to try Puffer fish. It was a great experience. The set that we purchased allow us to try the different cooking methods of the puffer fish which was delicious. Staffs are friendly and the servicing for 2 persons is huge. First time to try Puffer fish. It was a great experience. The set that we purchased allow us to try the different cooking methods of the puffer fish which was delicious. Staffs are friendly and the servicing for 2 persons is huge. The price on klook is the same as in shop, either way, we enjoyed the course as described. One advantage of the voucher is reservation, we avoided possibly long waiting time. This outlet at kuromon has a friendly Chinese staff, so we had no problems communicating with him. Other Japanese staff could speak minimal English, no issues for simple one word requests, but more complex ones they will take a while to understand. Overall, the experience is memorable and fun. Puffer Fish, due to the high poison, is rarely available, we were also apprehensive to try and careful to choose the shop we dine at. This place seems experienced, though we rarely see local guests, mostly foreigners. The price on klook is the same as in shop, either way, we enjoyed the course as described. One advantage of the voucher is reservation, we avoided possibly long waiting time. This outlet at kuromon has a friendly Chinese staff, so we had no problems communicating with him. Other Japanese staff could speak minimal English, no issues for simple one word requests, but more complex ones they will take a while to understand. Overall, the experience is memorable and fun. Puffer Fish, due to the high poison, is rarely available, we were also apprehensive to try and careful to choose the shop we dine at. This place seems experienced, though we rarely see local guests, mostly foreigners. Just show the voucher via phone. Easy and convenient. Having nice and fresh puffer. Great. Just show the voucher via phone. Easy and convenient. Having nice and fresh puffer. Great. Food and service was good - I took the tenraku set and got to sample the ingredient in many different ways. Food and service was good - I took the tenraku set and got to sample the ingredient in many different ways. Amazing meal. Would recommend. We booked the Umeda branch. location was difficult to find. Amazing meal. Would recommend. We booked the Umeda branch. location was difficult to find. Great deal of food served, but may not be to everyone's liking. Pufferfish texture is kind of like a crossover between frog meat and fish. Have to buy your own drinks which are quite pricey. Great deal of food served, but may not be to everyone's liking. Pufferfish texture is kind of like a crossover between frog meat and fish. Have to buy your own drinks which are quite pricey. Very convenient, found reservations. Ordered at the restaurant and coupon applied at cashier. Very good fugu. Had the sashimi, bbq and hot pot. Yuzu sherbet for dessert was very good. Ordered the sake with the roasted fugu, they light it at your table. So good. Very convenient, found reservations. Ordered at the restaurant and coupon applied at cashier. Very good fugu. Had the sashimi, bbq and hot pot. Yuzu sherbet for dessert was very good. Ordered the sake with the roasted fugu, they light it at your table. So good. Redemption was easy, service and food was good, recommended! Redemption was easy, service and food was good, recommended! we didn't even have to wait as we got there. the skin was too rubbery for my liking. we opted for the thick slice for an additional 200 yen. The sashimi wasnt too bad. the hotpot was nice but not fantastic. the egg porridge was made with the remaining broth. overall, interesting experience but probably just a one timer. we didn't even have to wait as we got there. the skin was too rubbery for my liking. we opted for the thick slice for an additional 200 yen. The sashimi wasnt too bad. the hotpot was nice but not fantastic. the egg porridge was made with the remaining broth. overall, interesting experience but probably just a one timer. It’s a great idea of booking restaurants in Japan from Klook. The food from Guenpin was delicious, service was great too. It’s a great idea of booking restaurants in Japan from Klook. The food from Guenpin was delicious, service was great too. Q: Can I request for a vegetarian meal? 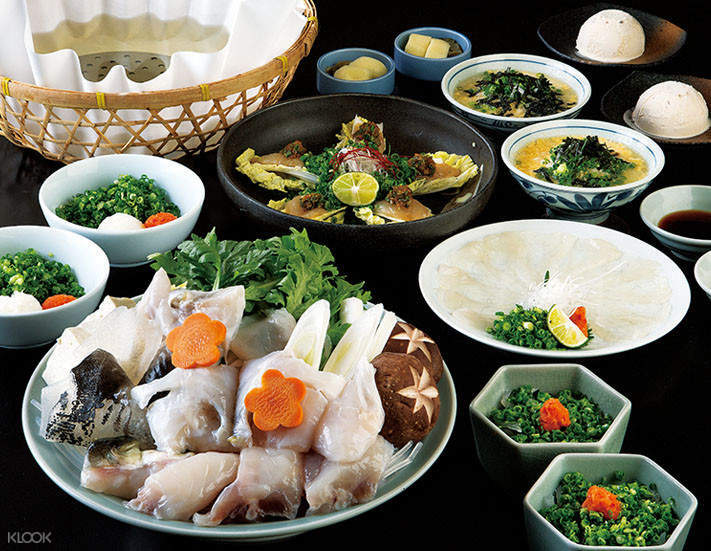 A: Only two vegetarian dishes will be served, one is a vegetarian platter (to be cooked in the pufferfish hotpot) and the other is cabbage salad.